The Polish authorities have denied entry to Poland to the participants in the Moscow-Berlin motorbike trip, Andrei Bobrovsky, the head of one of the bike motorcades participating in the trip, told Interfax on Monday. "The motorcade was not allowed to cross the Polish border," Bobrovsky said. Russian bikers from the bike club Night Wolves went on a motor rally connecting Moscow and Berlin on Saturday, despite the entry denial in Poland. The Moscow-Berlin motor rally timed to coincide with the Victory Day is scheduled for April 25 - May 9. The planned itinerary was to cross Belarus, Poland, Austria, the Czech Republic and Slovakia. 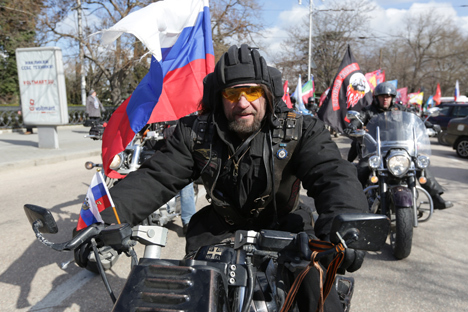 According to Alexander Zaldastanov, the Night Wolves bikers club president, 15 bikers were to take part in the rally. In Poland, these plans were met with protests. Poland's Prime Minister Ewa Kopacz called the planned rally a "provocation." "There is a political game involved in this affair," the prime minister said. German security agencies said that the bikers will not be allowed to stage a motor rally to Berlin's Treptower Park, where a Soviet soldiers' memorial is located, on May 9. Berlin police had received no application for the event to be organized in the German capital. But even if one is filed in the coming days, the organizers will receive a negative reply.